Similar to giant chess, the checker piece is also available in different sizes and colors. Checker piece also comes in giant size. 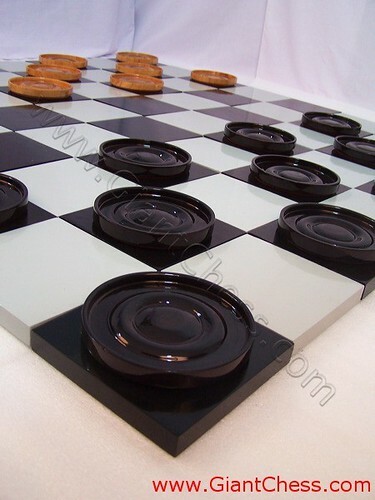 We offer the giant checker piece for board game and decoration. Placed in living room, checker piece becomes the point interest of your place. This set is constructed of the best quality of Teak wood, carved by our professional craftsman and polished well in black and brown. Perfect for garden, backyards, schools, recreation centers, country clubs, resorts, and camps. You can put it at your garden in long time without worry about the damage, because our product is made from best quality of Teak wood. At the bottom of the piece, we use flannel as a cover.